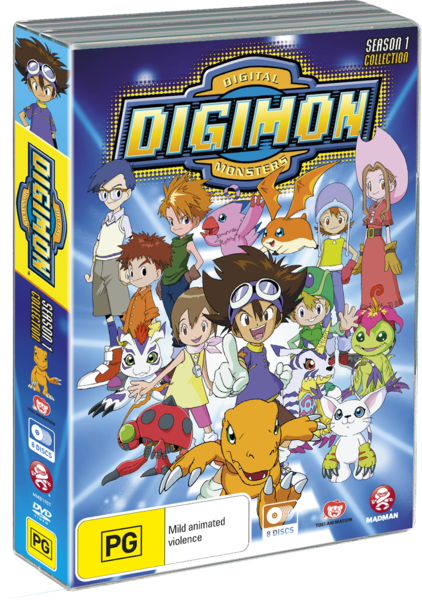 "Digimon, Season One" is an animated adventure show that starts off with a group of kids that just arrived at summer camp. The children are: Tai (An excellent soccer player that likes wearing goggles), Matt (One cool dude that loves blowing on his harmonica), T.K. (Matt's younger brother), Sora (A tom girl that's very brave), Mimi (A very spoilt girl in a pink cowboy hat), Izzy (A young computer mastermind), and Joe (A very over-concerned guy that simply hates getting into trouble). Not too long after starting summer camp we see the children meeting up with each other only to meet with a sudden weather change as it starts to snow. The group are confused to what is happening but then out of nowhere we see some very mystical devices appear before them and then drag them into a dimensional portal. 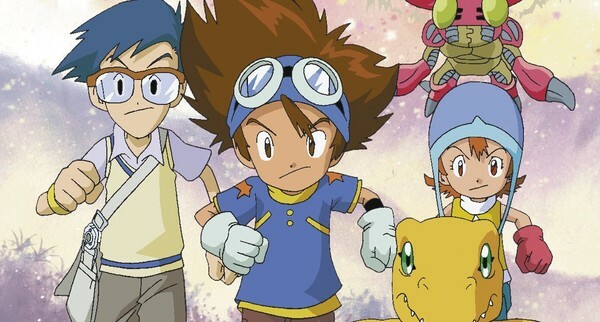 Once the group wakes up they are surprised yet again as they are met by a group of mysterious creatures named Digimon (short for Digital Monsters). They soon learn that there are many different kinds of Digimon and not too long after they are attacked by a huge giant bug-like Digimon named Kuwagamon. 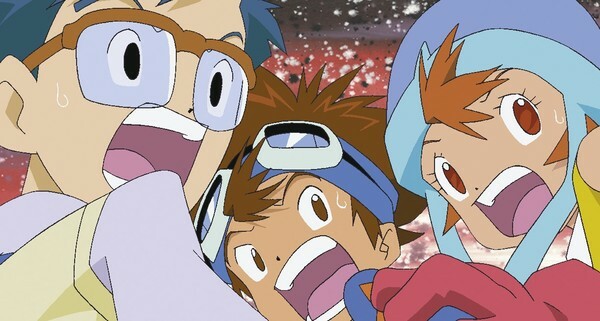 During the battle they learn that their Digimon can transform when they have enough energy but their power isn't enough to fully beat Kuwagamon and the children fall off a cliff due to Kuwagamon's attack and become lost. Meanwhile somewhere else in this mysterious Digital world we have a very evil Digimon named Devimon whom has learned of the kids and fears their power so he is out to destroy them and their Digimon. Who ever said summer vacation was supposed to be fun? (Click "Read More" to read the full review). The story in this show isn't as childish as it sounds as after the first episode it becomes much more mature. This show doesn't treat it's audience like idiots as it knows that children are capable of understanding and enjoying shows that aren't always happy go-lucky where the good guys always win without any consequences. This show is also mature enough for adults to enjoy just as much as the children (maybe even more) as you'll be hooked due the very well done drama. You are also getting a lot in this season with three really great and one very decent story-arcs to where it feels like that you have two or three seasons packaged instead of just one (I mean that in a good way as you get a lot of bang for your buck). While this is a serious show you will also find quite a bit of comedy that is not only just funny and charming but it also blends in well with the drama and doesn't feel out of place one bit. One thing this show could've done a bit better at was explaining some story details a bit better as they explain some things in a murky way to where it needed to be a little bit clearer. There's also a lot of action in this show and most of it is pretty good and even though it is predictable most of the time you can not help but to be excited from watching those scenes nonetheless. This show also doesn't have a lot of filler episodes in it so it's mainly meat with the bone (AKA filler episodes) only turning up during the final story-arc and even then there isn't much. This show also gets away with stuff that you can not get away in this day and age as you'll see alcohol consumption, tobacco use, blood, and even mention of the words "terrorist attacks" and while this may sound like a bit much you'll find it to be very mild. I like this as they didn't try to hide what goes on in the real world but they also didn't do it in a way where it wasn't inappropriate. Another positive is that for a show based on an electronic key-chain device they stuck very faithfully to those old toys as everything you could do on those devices all appear in this show. Characters in this show were really good with very charming personalities that helped make the characters really memorable. I also really liked the character development in this show as the characters really do mature in a way where they are taking huge steps forward with each episode. Seeing as this is quite a lengthy show you'll see the quality in art-work vary and it's very noticeable. Most episodes look very decent, you'll get some episodes that look above average but only during episodes in-between major arcs, lastly some episodes in this show look very spectacular to the point where it looks like a cinema film like "Digimon the Movie (2000)". While it varies you won't find yourself disgusted by an of the episodes which is a very good thing. I love the designs of the backgrounds for the Digital World as they are all very interesting looking with a great amount of imagination put into it. They can also be random looking at times with items that are very out of place like phone-booths on the beach and ships in the dessert for example. Instead of actually being out of place they end up being quite charming and fun instead. The background designs for the Real World are quite different as they have more of a serious, realistic look really adding to the feeling of traveling between worlds. Character designs in this show are just simply classic with well designed human characters and even better designed monsters. 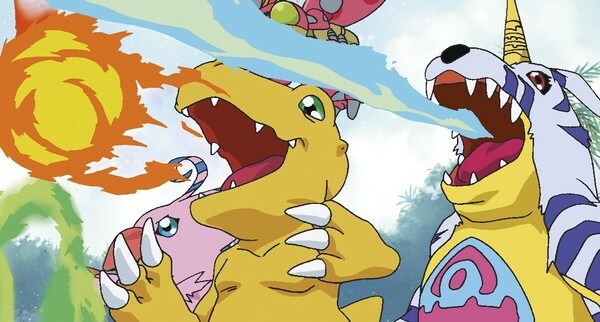 The Digimon have a lot of different designs ranging from small and cute to huge and kill it, kill it, kill it (AKA scary) and they are all very unique with a lot of imagination put into them. Animation in this show is pretty good but not perfect as you do get a roughly animated scene here and there but nothing that'll make you go crazy to where you shave your neighbors pet cat. This show only comes with the English dub and it was pretty good with voices that worked perfectly with all of the characters. The acting starts off a little rough but they improve pretty quickly and sound like that they were really into the show. One problem I have with the dub is that it can be a little inconsistent during the flash-back scenes as during the flash-back scenes they use different dialogue that was never in the original scene and it was a little weird. The soundtrack to this show is fifty-fifty as half of the tracks sound good with an up-beat action sound that makes you feel heroic, the other half of the soundtrack has not aged well one bit with a cheesy rap sound that will make you cringe a little. Sometimes this show doesn't use the soundtrack right as in some scenes they used music that didn't go with the scene and feels out of place. Despite not being mentioned anywhere on the box you get some special features and some very neat features at that. What you get are the text-less versions of the opening and closing credits of the Japanese version of the show. Now I wasn't expecting anything that special letter known any features at all and it was very interesting plus it will also be the first time that many people will get to see them. The opening credits didn't end up looking much different to the version we got in English as the only difference was the edited a bit differently but the footage we got was the same but just mixed up a little differently. Closing credits were very different to the one that we got as the footage was of the Digidestened in the background while the Digimon are in the foreground on a field digivolving while running. The music that was used sounded quite good with a nice "Power Pop" sound and it was a huge jump from the "Rap/Hip-Hop" sound we got in the English credits. These features are defiantly worth a watch right after you have finished the show. Overall this show has aged pretty well and is still really enjoyable to this day. Even though this is a long show you'll find yourself watching this series quite a few times with each viewing being just as (or even more) enjoyable. I am defiantly going to recommend you all to check out this show. Classic anime. Digimon. Digital Monsters. 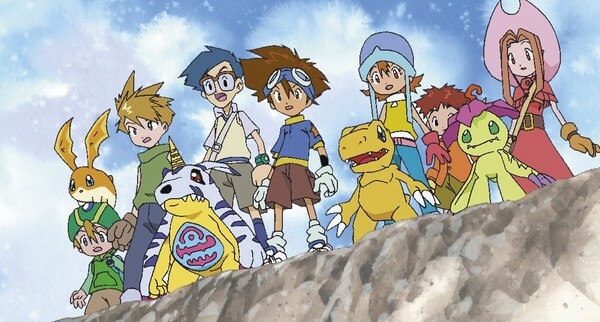 Digimon are the champions. Watched this show with my older brother as a kids. Ahh the memmories. Good write up bro.